Intense feeling and technical skill characterizes the work of the Scottish poet Robert Burns. His best work is in Scots, the language of southern Scotland. He is one of the greatest authors of that language in the last four centuries. 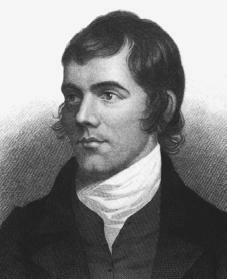 Robert Burns was born in Alloway, Ayrshire, Scotland, on January 25, 1759, to hard-working farmer parents. He began helping his father with farm work at the age of twelve. The difficulty of the labor later had a crippling effect on his health. Although Burns's formal schooling was limited, he loved to read and for a time he was tutored by John Murdoch, who thoroughly educated him in eighteenth-century English literature. While continuing to do farm work in Mossgiel, Burns began writing poetry, and his talents developed in a spectacular way. Many of his poems expressed his love of the country and its people and poked fun at his favorite target, followers of Calvinism (a religion that features a strict belief in God's absolute will over the affairs of humans). In 1786 he published Poems, Chiefly in the Scottish Dialect at nearby Kilmarnock, Scotland, and the book was a success. At this time Burns was twenty-seven, and he had written some of the most effective and biting pieces of satire (ridicule or scorn) in the language. Among them were "Holy Willie's Prayer" (a dramatic speech that mocked a believer in Calvinism) and "The Holy Fair" (a humorous description of a Scottish religious camp meeting). Other important poems that appeared in his first volume were "Address to the Unco Guid" (an appeal to the religious not to look down on sinners); "The Jolly Beggars" (a dramatic poem celebrating poor people); the masterful "Address to the Deil" (that is, to the Devil); "The Cotter's Saturday Night" (in praise of the Scottish countryside); and the moving "Auld Farmer's Salutation to His Mare" and "To a Mouse" (the latter a poem written to a field mouse who has been killed by a farmer while plowing). These and other poems by Burns are almost unequaled in their combination of accurate local language and depth of feeling. Not for centuries had such fine poetry been written in the Scots tongue. But 1786 was also a year of great distress for Burns. His affair with Jean Armour had resulted in the birth of twins, and her parents refused to allow the couple to marry because of Burns's reputation as a critic of religion. In addition, Burns was in love with Mary Campbell, for whom he wrote the song "Highland Mary," but she died in 1786 as a result of giving birth to his child. Burns considered leaving the country for Jamaica, but he abandoned the plan and spent the winter in Edinburgh, Scotland, where he was praised and honored for the success of his book. Early in 1787 a new edition of his poems was published that made him famous not only throughout Scotland but also in England and internationally. After a summer and fall spent touring Scotland (the only real traveling he ever did) and restarting his affair with Jean, Burns spent a second winter in Edinburgh. In March 1788 Burns returned to Mauchline and finally married Jean, who had given birth to a second set of his twins. After his wedding Burns turned his efforts to supporting his family. In 1788 he leased a farm at Ellisland, Scotland, forty-five miles from Mauchline. After annoying delays in the building of his house and several rough years trying to make an income from his farmland, he moved with Jean and the children to Dumfries, Scotland. In 1789 he had begun working as a tax inspector, a profession in which he continued until his death. At Ellisland Burns had little free time, but it was there that he wrote his masterpiece of comic humor "Tam o'Shanter," his one outstanding piece of narrative verse. Burns also wrote numerous songs (some of them original lyrics for old tunes, some reworkings of old lyrics) for The Scots Musical Museum, a collection of Scottish songs with which he had been associated since 1787. From 1792 until his death he also contributed to a similar work, A Select Collection of Original Scottish Airs. Most of Burns's poetic efforts in the Ellisland and Dumfries periods was in this area of song writing and song editing (he had written songs earlier but had usually not published them), and the results were very popular. Among the lyrics that he composed or reworked were "Mary Morison," "Highland Mary," "Duncan Gray," "Green Grow the Rashes, O," "Auld Lang Syne," "John Anderson, My Jo," "Scots Wha Hae Wi' Wallace Bled," "A Man's a Man for A' That," "A Red, Red Rose," and "Ye Banks and Braes o' Bonie Doon." These are true song lyrics—that is, they are not poems meant to be set to music but rather are poems written to melodies that define the rhythm. Burns's years in Dumfries were years of work and hardship, but contrary to reports written after his death, he was not shunned by others and he did not fall into moral decline. His fellow townsmen and his coworkers respected him. His health, which always caused him problems, began to fail, and he died of heart disease on July 21, 1796. His wife gave birth to their last child on the day of his funeral. Lindsay, Maurice. Robert Burns: The Man, His Work, The Legend. 2nd ed. London, MacGibbon & Kee, 1968. McIntyre, Ian. Dirt & Deity: A Life of Robert Burns. London: HarperCollins, 1995. Sprott, Gavin. Robert Burns: Pride and Passion. Edinburgh: HMSO, 1996.